Everyone’s home is a place of peace, solitude, comfort and upon everything else, safety, so what happens when that gets trampled on? No one can imagine the fear of a person after someone has been in your house to rob you of your belongings or cause some form of vandalism. No one should experience a sense of discomfort in their home but unfortunately, this happens and we need to prevent it. I will be discussing ways on how to protect your home to prevent anyone unwarranted entering or entering again for that matter. There are 3 essentials when it comes to protecting your home, Protecting your home from the inside, Protecting your home from the outside, and Protecting your home when you’re on vacation. It is always important to build or buy a fence around your property with a gate which you can lock in the evening, people can still climb over the fence if they want to, true, but even so they will create enough noise for you or your neighbours to realise and maybe have enough time to call the police. If you build a good fence it would be very challenging for any burglar to climb over it quietly. And if you can’t afford a fence you can always grow a plant fence which may take a bit of time until it grows. Another viable options is to build another solid gate infront of the door. This comes without saying that if you own an expensive car or bike, place it somewhere safe in the evening and lock the door. You can’t say who will be walking in the middle of the night and would like to either have your items or vandalise them. Installing motion sensor lights will create awareness when people you aren’t expecting get too close for comfort. Get to know your neighbours, make friends with them, so if the time comes they can take up the initiative and call the police. Don’t make enemies with the people you will be living next to for most of your life. Most importantly when you aren’t there or you are sleeping, keep everything locked, don’t be led to believe that since you live in a relatively safe neighbourhood you won’t get robbed. Always stay safe, and be alert, and in doing so it will avoid you a lot of hassle. If you are a proud owner of a new home, always keep in mind that the first thing to do is changing the locks, your previous owner might still have the keys, so always be on the safe side and change them! Keep the essentials and expensive items in a secure box or locations where it would be challenging even if someone manages to enter your house. This is imperative, do not label the keys you own just in case you lose them, and always keep your keys and wallet away from each other, your I.D holds your address so if you lose your wallet and keys at the same time you are in trouble. Keep them in different pockets and constantly check that they are there. This will create ease of mind when you are away if the alarm rings the robber will try and make a run for it because the whole street knows something is happening. Also with some Home Security Systems, the local police will be informed and arrive at your house after a certain amount of time. Your neighbours are closer in a common of apartments. Build a relationship with them that they would let you know if they see something strange happening near your door. Protecting your home when you’re on Vacation. 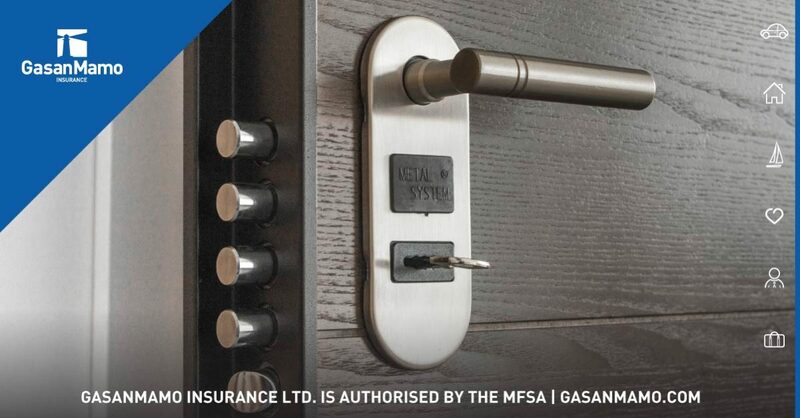 Double or Triple check all the locks and your security system if you have one, you can never be too safe. Speak to any one of your family members or friends that you trust and tell them to check if your house has been untouched for the duration of the trip. This is imperative if you want people not to touch anything of your belongings. You will never know who is looking at your Facebook feed so it is best if you do not share anything unless they are your most trusted friends and family. These tips will help you feel more comfortable at home, you do not want the feeling that your house is not safe and that some people know how to access it. Be safe and secure and always take the necessary precautions to ensure maximum protection. Have a look at our home insurance packages and also read our guide to landlord property inspection to stay both safe and without any worries!